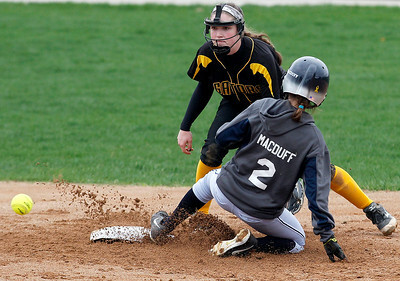 Matthew Apgar - mapgar@shawmedia.com Cary-Grove's Molly MacDuff slides safely into second base for the steal as the throw to Crystal Lake South's Carly Chovanec heads into the outfield during the bottom of the first inning in their softball game on Monday, April 20, 2015 at Cary-Grove High School in Cary. 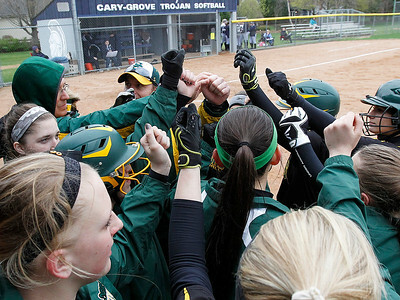 Matthew Apgar - mapgar@shawmedia.com Crystal Lake South Gators huddle up before their softball game against Cary-Grove on Monday, April 20, 2015 at Cary-Grove High School in Cary. 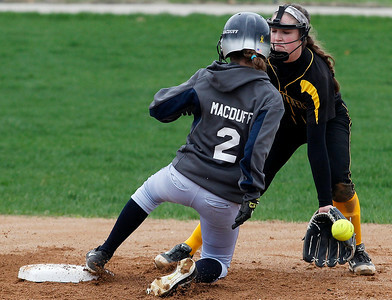 Matthew Apgar - mapgar@shawmedia.com Softball bats lean up against the Cary-Grove dugout during their softball game against Crystal Lake South on Monday, April 20, 2015 at Cary-Grove High School in Cary. 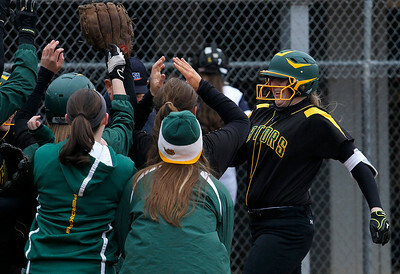 Matthew Apgar - mapgar@shawmedia.com Sam Burgard of Crystal Lake South jumps onto home plate and into a crowd of Gators after hitting a grand slam in the second inning of their softball game against Cary-Grove on Monday, April 20, 2015 at Cary-Grove High School in Cary. 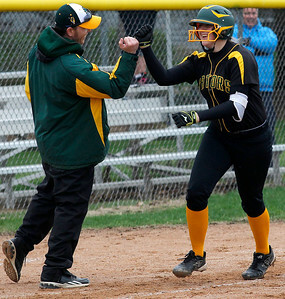 Matthew Apgar - mapgar@shawmedia.com Sam Burgard of Crystal Lake South bumps fists with coach Scott Busam as Burgard rounds third base after hitting a grand slam in the second inning of their softball game against Cary-Grove on Monday, April 20, 2015 at Cary-Grove High School in Cary. 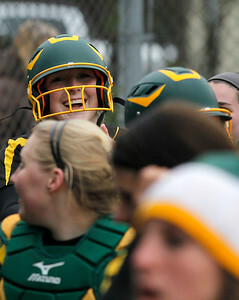 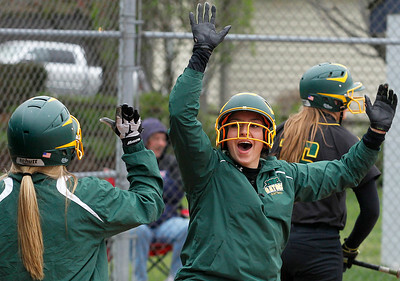 Matthew Apgar - mapgar@shawmedia.com Sam Burgard of Crystal Lake South, back, smiles with her teammates after hitting a grand slam in the second inning of their softball game against Cary-Grove on Monday, April 20, 2015 at Cary-Grove High School in Cary. 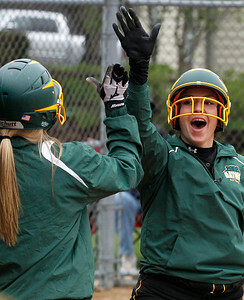 Matthew Apgar - mapgar@shawmedia.com Crystal Lake South's Brooke Maddox jumps up to hi-five teammate Jenica Terry after scoring during the first inning of their softball game against Cary-Grove on Monday, April 20, 2015 at Cary-Grove High School in Cary. 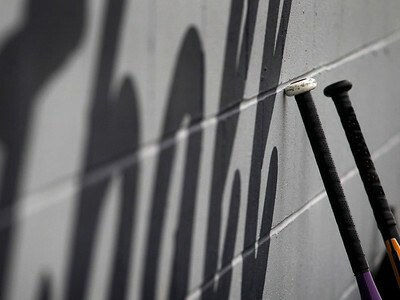 Softball bats lean up against the Cary-Grove dugout during their softball game against Crystal Lake South on Monday, April 20, 2015 at Cary-Grove High School in Cary.